The Islanders spent much of last night trailing the Penguins, but a productive third period put them ahead as the clock wound down. The Islanders finished up a rather unproductive four-game home stand with a match against the Vancouver Canucks on Tuesday. They jumped out to an early lead on a Brock Nelson wrist shot two-and-a-half minutes into the game, followed by a Matt Moulson goal on a power play two minute later. That 2-0 lead only lasted all of 16 seconds, as Vancouver quickly scored its first goal, and then a second before the period’s hallway mark. Moulson broke the 2-2 tie with another power play goal five minutes into the second period, but Sedin tied the game again with seven-and-a-half minutes to go in the period, and Higgins gave the Canucks their first lead with 18 seconds to spare in the period, going up 4-3 on a wrist shot. After the third period nearly passed without a single goal it looked as though New York was going to lose in regulation, but Frans Nielsen smacked in a wrist shot to tie the game once more with just over a minute to go. Unfortunately the Islanders still fell, as Brad Richardson ended overtime in Vancouver’s favor 2:16 into the OT period, handing the Islanders a 5-4 loss. Nabokov stopped 28 of 33 shots on the night. Having dropped 3 of 4 at home, the Islanders travelled to Pittsburgh last night in hopes of earning a win on the road. Moulson scored the first goal of the night halfway into the first on a power play, but Jussi Jokinen tied the game three minutes later. Sidney Crosby broke the tie on a snap shot in the second, giving the Penguins a lead which lasted for over a period. Nielsen tied the score just under 13 minutes into the third period, but Deryk Engelland put Pittsburgh back ahead 16 seconds later. Pierre-Marc Bouchard tied the game once more less than a minute after that with his first goal of the season, and the score stayed 3-3 for several minutes. 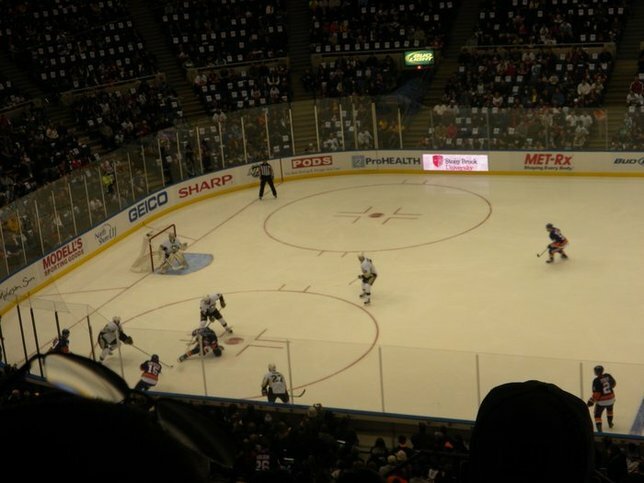 Josh Bailey gave New York its first lead since the middle of the first period with an assist from Nielsen as the clock ticked down to its final minute and forty seconds. That score help up through what remained of the game and Islanders won 4-3. Nabokov stopped 39 of 42 shots on the night. The Islanders will return home to host the Flyers at 7:00 PM tonight. The Islanders will be playing the Flyers tonight, but the Philadelphia team already played against New York once this week. Both teams entered with a notably poor record in the season’s early going. Matt Read put Philly on the scoreboard first on an unassisted short-handed goal halfway into the first period. Brad Richards knocked in a wrist shot with just over a minute left before the end of the first, creating a tie which would hold for over a third of the game. After a scoreless second period, Braydon Coburn broke the tie in the Flyer’s favor with a slapshot 3:33 into the third. That was the last bit of offense mustered by either team, and the Rangers went on to lose 2-1 on a night in which Cam Talbot took the goal, blocking 25 of 27 shots. The Rangers will finish their nearly month-long road trip in Detroit at 7:00 PM tonight. Still Looking for Festivities? 10 Places To Spend New Year's Eve! Subject: LongIsland.com - Your Name sent you Article details of "Islanders Snap Losing Streak, Rangers Still Struggle"